Click here to see more plastic-free, zero-waste food and recipes. When we first moved here, the language barrier intimidated me into accepting food with whatever trappings were offered. But the growing rage I felt towards Paris prices soon accompanied a passable level of French and a significantly higher level of entitlement. If my weekly grocery bill was going to equal a monthly car payment (for a Honda, no less), I better not have any trash to take out afterward. We opted to forgo the freezer in this apartment, and I'm hoping our next home will skip the refrigerator. 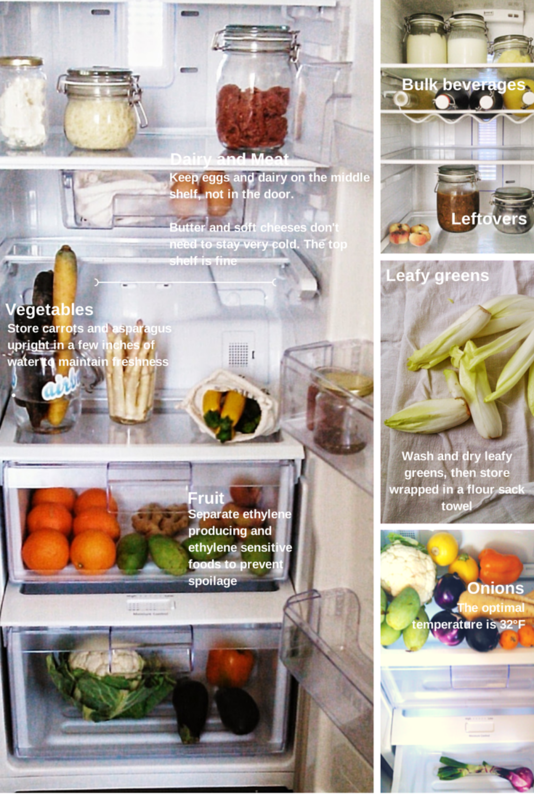 Until then, everything is organized according to Cornell's guidelines for storing organic food. Fatty or sweet things, like crème anglaise, homemade coconut milk, butter, and crème fraîche belong on the top shelf (pictured). Wine and juice go on the rack, with leftovers below and eggs in the drawer. Finally, separate dairy and meats on the middle and lowest shelves, respectively- larger cuts, like côte de boeuf, can be wrapped safely in a flour sack towel with a wooden board underneath. I also make jam and condiments (mainly harissa and mayo) at home, all of which go in glass jars in the door. My friends say it's a true American refrigerator, on account of its size :) You can freeze in glass jars or stainless steel containers. Don't fill above the shoulder and allow room for expansion in flat edge jars. When I’m in Cleveland, I freeze homemade tortillas wrapped with cloth stored flat in a stainlsss steel container, rolled in cloth in a large Ball jar, or simply in a cloth drawstring bag or bento bag. You can do the same with cookies, muffins, breads, croissants etc. Kathryn from Going Zero Waste has a detailed guide on freezing plastic free and uses a pillowcase to preserve baked goods. Keeps well at room temperature. Only put ripe apricots in fridge, in low-humidity drawer. Wash, dry, and store wrapped in a cloth towel. Wash, dry thoroughly between two towels, then store wrapped in a towel in a drawer. Keep in an open jar with a little water for stems. Trim ends, then store upright in a glass with a little bit of water. Room temperature until ripe, then refrigerator. Room temperature. Store loose with an apple to speed ripening. Room temperature until ripe, then loose in refrigerator. Keep at room temperature away from ethylene-sensitive produce. Unstacked, in a cool, dry place away from the sun. Trim stems, then keep upright in a glass jar with water at room temperature. Trim, wash and dry greens, then keep wrapped in a towel or glass container with moisture. Scrub roots and keep in high humidity drawer or damp towel. Store with apples to ripen. Good in refrigerator or at room temperature. Wash, dry, store loose in crisper drawer. Soak in water with a splash of vinegar. Rinse, then dry flat between two towels. Leave uncovered in drawer. To prevent crumbs, drape a towel over unwashed florets first, leaving the stem exposed. Keep whole pineapple out of the fridge. If you're not eating within three days, core, cut, and place in airtight glass jar. Store loose in a humid drawer. Scrub, store upright in a jar with water. Store vitelotte in darkest part of the fridge. Otherwise, in a cool, dark, dry place away from onions, in wood, wire, metal or cloth. See beets. Save the radish greens- they're delicious. Rinse, keep in a humid drawer or damp towel. Store celery root the same way. Store unwashed in the fridge in a netted bag, small wooden basket, or loosely closed glass jar. Store loose in the refrigerator or wrapped in a cloth towel. Best at room temperature. I stack them in a glass vase or fridge drawer. Do not wash. Store in crisper. Room temperature or crisper, washed. Store loose, unwashed, in crisper. Soak in vinegar with water, dry, then keep in an open bowl in fridge. Arrange in a single layer on a plate. Place in fridge. I buy fresh purple garlic, which needs to be kept in a cloth bag at room temperature or refrigerator drawer. Never refrigerate, they get mushy. Keep in a wooden basket or open glass jar. Store with apples to speed ripening. Store unwashed in refrigerator, loose or in a bowl. Same as radishes and beets. Store loose in a humid part of the refrigerator or in a damp towel. Keep at room temperature. Wrap in cloth and place in fridge for longer storage. I really think that a refrigerator is unnecessary for most produce. Milk and meat are really the only things that a fridge is fairly essential for. It's also nice to have a way to cool beverages. But I only have a chest freezer that is tiny and does not run all the time, so we put the frozen things at the bottom, and more refrigerator-type items at the top. It works pretty well! And as for my fruit, I have a ledge that I put it on, and that way it is eye level and I don't forget about it in the fridge. 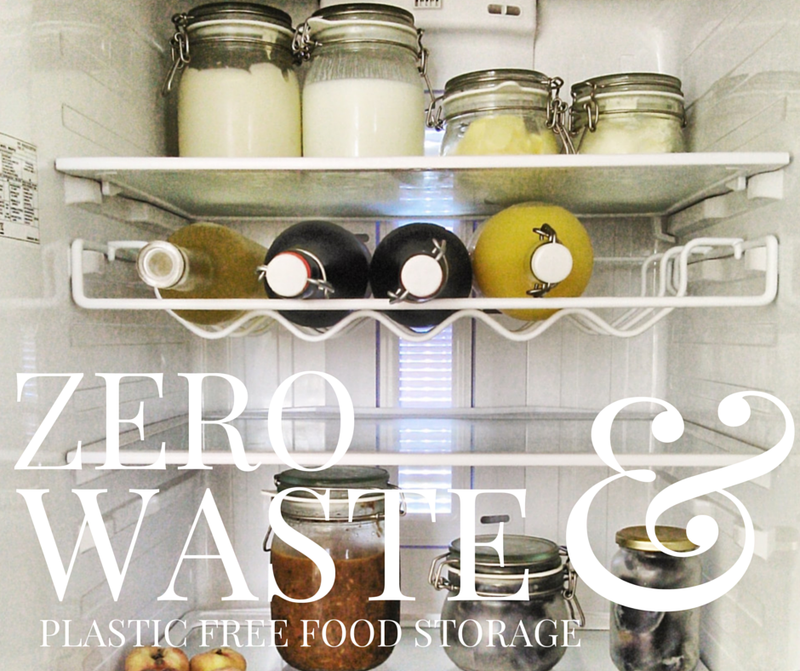 :) I think American size fridges and freezers encourage lots of waste. Good for you for thinking about these things! Hi Leah! That is a great idea - a much more efficient way to store produce. It's funny, here when we buy meat they tell us to keep it out of the fridge. We buy meat so infrequently and I use it for my husband and his friends within a day or two so I usually need to store it outside before cooking; the butcher says this keeps the flavor from changing. I never would have thought about that! There is always the risk of food poisioning from leaving meat out. The temperatures between 40°f -140° f are risks to any food that needs to stay cold-which include meats, dairy and eggs. Most of this is due to big industrial farms and the methods they use to produce your products. If you look at pictures of my fridge on Instagram, I keep my fruits and veggies in cloth normally. Plastic leaches more slowly in the refrigerator, and if you eat fresh produce quickly it's less of a problem, but films and items under occlusion exposed to heat leach chemicals into food rapidly. My two biggest problems with attaining zero waste are 1- we buy bulk meat for the year because it is cheaper to buy grass fed meat like this for our family and it doesn't get freezer burned because it is vacuum sealed.... but then I have the plastic vacuum seal to dispose of.... and 2-are the plastic bags our bulk food comes in. They don't have a fill your own area. I do try to buy largest quantity that we will use to bring home and store in glass jars. I also try to reuse the bags a few times. Could you maybe ask where you get your meat if they could just wrap it up in butcher paper? Granted, there's probably still some plastic in the butcher paper, but overall a lot less waste. I also try to buy things like flour and sugar and such in paper bags that can go in my compost. Our bulk stores won't let you bring glass containers to fill them up, and I don't have bags yet that will hold finely powdered items. I recently purchased grass fed pork and beef from a local farm. Since I purchased the animal I could request that it not be vacuum sealed. I picked up the meat and froze some in glass containers and wrapped some in pink butcher paper (apparently the white paper is plastic coated) and then used any plastic bags I have saved from purchases of items I’m not able to get plastic free to protect the meat from freezer burn. I have been doing this with whole chickens for awhile and it works well and gets around the vacuum sealed waste issue. It took a few tries to find a farmer who was on board but it was worth asking. great info - but I have to ask where you got the beverage rack??? I love it and can't seem to find one online... thanks! I keep all my produce in the fridge cept for bananas because I've had pest problems before because of untidy neighbors and I have no room in my 6ftx10ft small kitchen with little coulnter space. So this is a perfect list for me! When you go to the store and purchase produce, do you put them in the plastic bags you get there or just in your cart and scrub it really well? I currently am only using those plastic baggies for produce that doesn't get peeled (onions and potatoes don't get put in baggies anymore), but I still feel I am using too many because I can't get over how dirty shopping carts must be. What do you do instead? Don't forget produce is grown on dirt, and transported in trucks! I always feel that the shopping cart is the least of the problem, and just wash things when I get home. Love this post! Pinning it now. But shouldn't those upright carrots have their *stem* ends in the water? Hi! Ok this is verrry interesting. Up until now I thought plastic bags ripened things faster because they trap the ethylene gases. I read in the Washington Post that experts recommend poking holes in plastic bags so produce doesn't spoil as soon. Do you mind sharing what kind of produce you buy, maybe that has something to do with it. So FEMA recommended storing produce in airtight glass containers (If you have old spaghetti jars or something that works) after the hurricanes in Florida and Texas. People were without refrigerators and any plastics that had been exposed to floodwater were compromised, plus fresh produce is still pretty scarce right now so they want it to last as long as possible. The Florida climate is tropical so maybe that could help in your situation. I thought this was an interesting article on keeping good fresh in the tropics : http://www.costaricantimes.com/keeping-food-fresh-in-the-tropics/17857 I lived in se Asia for six months and I noticed people kept fruits and vegetables away from each other in the fridge and didn't wash them until right before use, which seemed to keep things from spoiling as quickly. Some things, like tomatoes, eggplants, and stone fruit though, I just left on the counter. You probably already knew all this, I'm sorry if I'm not much help!